Members of the former Tarlair Model Boat Club visited Peterhead last month to present donations to two worthy causes. The club was recently wound up after 40 years due to a decline in members. At its peak the club had more than 100 members from Macduff and Buckie all the way down to Peterhead. 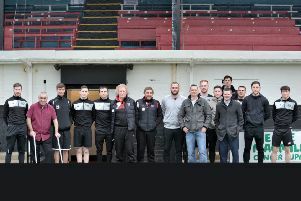 Club treasurer Jim McHattie said: “This is the end of an era for us. The members gave Cancer Research UK and Peterhead Community Hospital’s Asthma Clinic £1,012 each on Friday, September 28. They visited the Peterhead Cancer Research charity shop on Drummers Corner and presented their donation to store manager Diane Duthie. Commenting on the donation, Diane said: “This is an amazing amount, we are very grateful. The Tarlair Model Boat Club members then took a short trip up to Peterhead Community Hospital and gave their second donation to practice nurses Sharon McLean and Paula Stephen. Commenting Sharon said: “We would like to thank the club members for thinking about us, it is very much appreciated.